Gushing and glowing over SUNO’s bold prints is an act of pattern worship we’re well versed in. 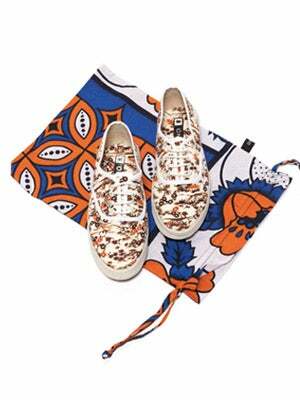 We recently fell in love with the brand's funky printed summer ’12 sneaker collection, which has added the right dash of intentional cool to our dresses and cutoffs. As if its commitment to wildlife and fair-trade practices weren’t enough, now Suno’s given us another reason to start steppin’, or should we say, reppin’? The brand is calling upon some of its closest friends (and R29 favorites! ), including Pamela Love, Susie Bubble, Natalie Joos, Meredith Melling Burke, Caroline Issa, and many more to assemble a top-notch group of sneaker ambassadors. What does such an esteemed position entail, you ask? Luckily, it’s less diplomatic and more instamatic. The ladies will photo-doc themselves wearing their shoes throughout their everyday lives, no doubt serving up some serious style inspiration. Plus, we’ll get a sneak peek into the travels of some of the trend- and jet-setters we're always down to keep up with. To see where their soles are headed, visit the news section of SUNO’s freshly updated website beginning August 29.